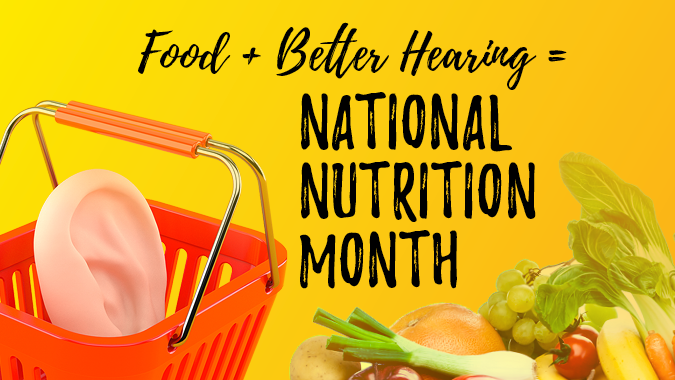 March is National Nutrition Month, and that makes this an especially great time to talk about hearing wellness and nutrition. Never thought about food in relation to your ears? You’re not alone. But considering food is a critical source of elements crucial to healthy skin, muscles, organs, and more, it’s no wonder that nutrition and hearing are connected. Take children and hearing loss, for instance. Did you know that a lack of adequate nutrition early in life could mean problems with hearing later on? A study published in the American Journal of Clinical Nutrition in February 2018, for example, found that young adults who experienced poor nutrition in their preschool years had double the risk of hearing loss versus their better-nourished counterparts. Though the research focused on a population with ongoing malnutrition issues and limited health care access, the study adds to the body of research linking nourishment — broccoli, anyone? — and hearing health. These delights from the sea not only please a discerning palate but can provide potassium, an important mineral for regulating blood and tissue fluid levels — including in the inner ear, which plays an important role in hearing and balance. Choices abound when it comes to sources of folate, which studies have linked to healthy outcomes such as decreased risk of hearing impairment among older men. Whether you’re into dark green veggies, broccoli, avocado, escarole, or edamame, you can find folate-rich foods to match your tastes. Leafy Greens, Whole Grains, and — Hey — Dark Chocolate! Yep, dark chocolate’s on our list of foods containing magnesium, which — combined with vitamins A, C, and E — can help thwart noise-induced hearing loss. Other magnesium sources include pumpkin seeds, kidney beans, chicken breast, and more. Serve them mashed, whole, in a soup, or in a salad bowl — whatever your delight! Lentils — along with other legumes and foods such as beef, oysters, and dark-meat chicken — offer zinc, which supports the immune system and may help fight tinnitus or ringing in the ears. Healthy eating is important year-round, so keep these helpful tips in mind for National Nutrition Month and beyond. Want to learn more about hearing wellness and nutrition? Contact us! We’re happy to answer your questions.